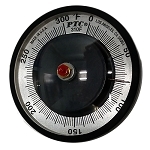 PTC®'s fully enclosed surface thermometers are unilateral thermal sensors, which measure the temperature of a contact surface.These instruments are fully enclosed within a convex glass and a silicone rubber gasket seals the metal and glass parts against moisture. 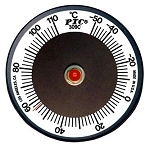 The fully enclosed thermometer can be utilized in the lab as well as in construction measuring pavement and concrete temperatures prior to coating. 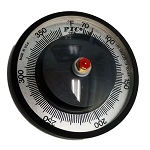 The 310 Series of thermometers are 2 inches in diameter and weigh only 1 ounce. 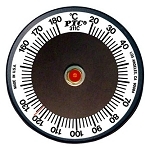 The bimetallic sensor is designed to permanently retain its calibration. 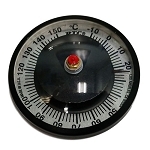 These thermometers can be used for external wall leakage temperatures of refrigerators, cold chambers, freezers, ovens, and boilers; for temperatures of electric motors and cylinder blocks, plastic dies and rubber molds; temperatures of journals and other bearings. All types of ducts, wall, ceiling, and floor temperatures of building or storage areas. 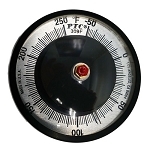 Horizontal areas are never a problem since the instrument is simply placed on the surface. For non-horizontal areas, there are two methods of attachment in one accessory kit of silicone grease and a magnet & leaf spring. The bottom area of the unit can be coated with a thin layer of silicone grease and the unit then pressed into position. The grease provides positive thermal contact and will hold the thermometer in place over all specified temperature ranges. On ferrous surfaces, a magnetic leaf spring holds the instrument firmly against the surface. Simply bend the leaf spring and place the end over the top of brass nuts.